Contains amino acids which help muscles recover and repair. A great pre and post workout snack! Put the blueberries in a pan with 1 tablespoon of water. Bring to the boil and simmer until the blueberries are really soft and squishy. Add the maple syrup and coconut oil and heat through until combined. Combine all the other ingredients in a big bowl. Add the blueberry mixture to the dry mixture and stir until well combined. The mixture will be sticky. Divide into 16 evenly sized portions and roll into balls. Refrigerate for 1 hour before eating raw. Alternative: You can also bake these bites. Preheat the oven to 180°C (160°C fan/350°F/Gas 4). Place on a large baking tray lined with parchment paper, and bake for about 15 minutes. Allow to cool and serve. You can buy ‘Energy Bites’ in bookshops, on Amazon or on the DK website. Published by DK on 15 January 2016, £6.99. DK.com. A fabulous collaboration with established cookery writer Annie Nichols and gorgeous photographs by Will Heap. Hi, made these last night as I have the DK energy balls book. They have turned out lovely. One question I have is is they need to be stored in the fridge? If they do how long they can stay outside the fridge before they need to be eaten. I’m sorry it’s taken me so long to get back to you. I took a bit of a break from social media whilst the kids were on holiday, but am now back and ready to answer your question! 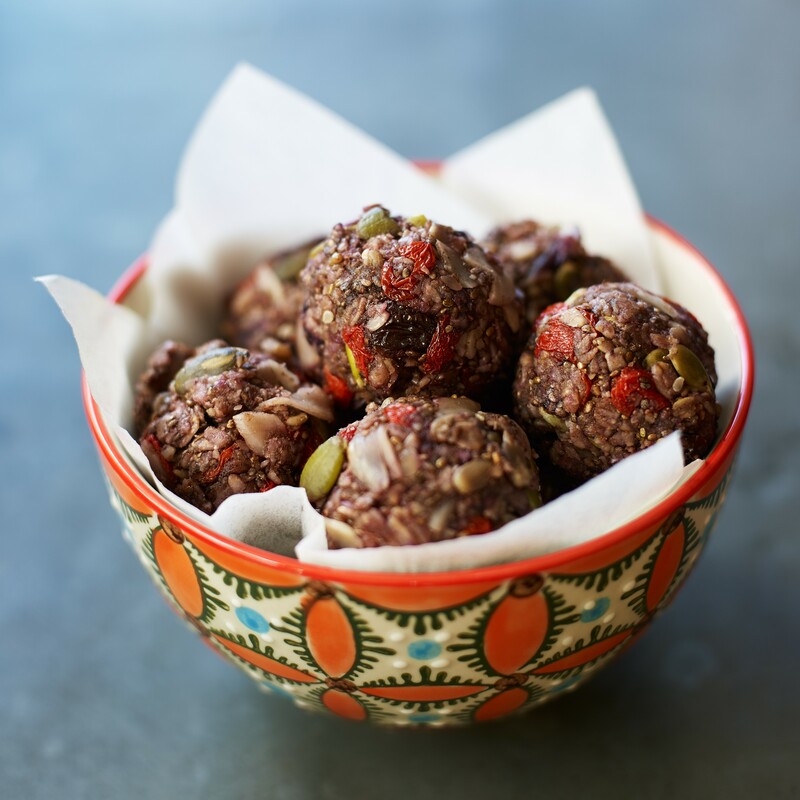 I love these energy bites and make them regularly, both raw and baked. If you’re eating them raw then they do need to be kept in an airtight container in the fridge and will last around 1 week. If you bake them then they can be stored out of the fridge in an airtight container where they’ll also last for around 1 week. I sent a message last week saying how good the granola balls are. I now need to make a second batch! Any more reviews of the book yet? We’re still waiting for that nice Mr Amazon to deliver our copies – mind it is a very long way to Australia! SO EXCITING! !